Viktor & Rolf will launch Spicebomb Night Vision, a new fragrance for men. Spicebomb Night Vision is a flanker to 2012's Spicebomb, and will be fronted by singer-songwriter Jacob Whitesides. The notes include grapefruit, black spices, oriental fougère accord, sage, geranium, roasted almond and tonka bean. 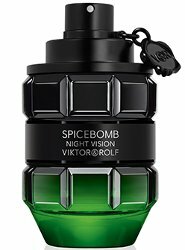 Viktor & Rolf Spicebomb Night Vision will be available in Eau de Toilette; I will update with sizes when I can. Update: Viktor & Rolf Spicebomb Night Vision was developed by perfumers Nathalie Lorson and Pierre Negrin. Additional notes include cardamom, mandarin, Granny Smith accord, black chili accord, black pepper, clove, nutmeg. It is available in 50 and 90 ml Eau de Toilette. Wow! I can’t wait to try this. The partially green bottle looks attractive although I would never bring the bottle if I am flying or otherwise have to go through Security! Yeah I would say it is NSFA ( not safe for airports). The wording of the original article, in French, implies it is VERY different from Spicebomb, which could be too bad. I like the green bottle but hope it is not dreck. Great take on the bottle and those notes call to me…..
Agree, could be really fun. That bottle is just flat out hilarious.